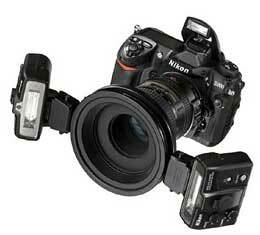 Built-in Speedlight of D200, D70s or D70 serves as system's Master controller. Supplied as a complete ready-to-use system. In addition to above, system also includes 52mm, 62mm, 67mm,72mm and 77mm mounting rings to accommodate most AF Nikkor lenses, AS-20 Speedlight Stands, SJ-2 ColorFilter Set, SW-C1 Flexible Arm Clip, SW-11 Extreme Close up Positioning Adapter, SW-12 Diffusers, fittedStorage Case and more. SU-800 Wireless Speedlight Commander available separately, providing compatibilitywith Nikon i-TTL SLRs without built-in Speedlights including D2X, D2HS, D2H and F6. SU-800 Wireless Speedlight Commanderprovides additional functionality with SB-800 and SB-600 Speedlights. Please Note: Camera body and lens are not included.